Modul8 was created to elevate the profile of contemporary South African design and ingenuity among the South African public and abroad. It is about time that South Africans and the rest of the world can own high quality 1st world design and workmanship. Our mission is to make great design spaces and objects available to both the unexpected and well informed. Gone are the days where temporary buildings and mobile buildings have to be cheap and dreary. Modul8 was invented to improve your quality of living, holiday and working spaces even if far away from home. This can however be your primary dwelling, a social area, a community space or even place of education and relaxation. 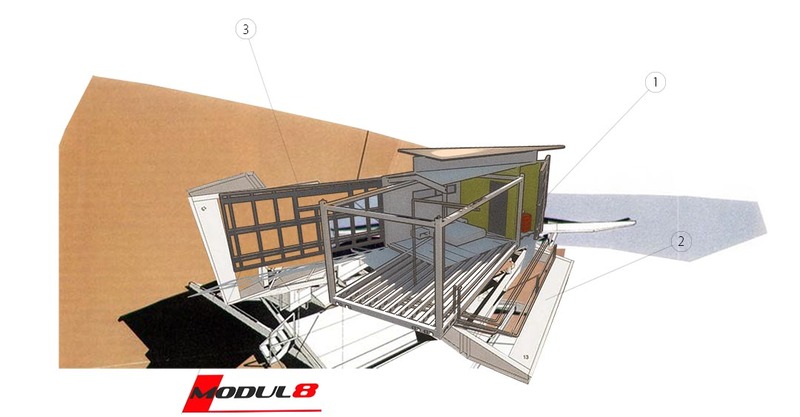 Modul8 can be your sanctuary in the backyard, your spiritual space or your cabin in the woods. Modul8 is set up for improving living. When compiling your building, one can start with a basic building block, the single bedroom house. When leaving home after school or studies, your basic need is that of a bachelor pad or basic room with amenities. As one finds a partner, your needs change and so does the need for more space and privacy. Your partner can bring their own Modul8 unit and double the existing facilities. As children are born or more spacious areas are required, more rooms can be added or extended outside areas can be clipped on. As children leave the house or one prepares for retirement, modules can be left to the children and the basic starter modules could be moved to your favorite retirement spot on the beach, under the deep blue sky with scenic ocean views, next to a crystal stream in the woods or in grass plains, surrounded by wildlife. This is no new technological wonder, at least not in Europe or America. It is an effort of arranging existing ideas and materials in a new and exciting way. It opens doors to previously unexpected opportunities and possibilities. This entry was posted in Modul8. Bookmark the permalink.